Ohhhhh, essential oils. And CBD oils, while I’m at it. It’s something a lot of chiropractors sell and something I get asked for an opinion on fairly regularly. I don’t sell them, but I’m all for them, as long as you are aware of what they’re actually doing. 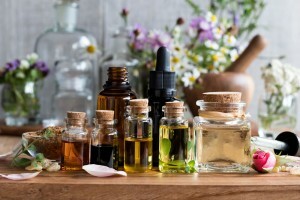 Essential oils are great natural pain relievers in the short term…just be aware when you need a long-term solution. Those things can be great as a natural source of reducing some symptoms, but my overall opinion is pretty similar to the take that I have for over-the-counter medicine or prescription medicines. If there’s a physical problem, you can’t expect to take a chemical and expect a physical solution. As an extreme example, assume you herniate a disc in your back and that herniation causes pain shooting down your back. You can bathe in lavender and use all the fragrances…it’s not changing the state of that disc. It’s just not. That may be a bit of an extreme example, but the same holds true for physical alignment issues that cause dull aches and pains, headaches, and limitations on a healthy life. What’s the cause of those pains? Fix that. At times it can difficult to find the time to get to the chiropractor’s office for treatment. So for those instances, if you need something to grab quickly and provide natural symptom reduction, that’s understandable. Go for it. Just as long as you’re aware of what it’s actually doing.